South Africa 6-181 (AB de Villiers 48*, Hashim Amla 41, Saeed Ajmal 2-34) beat Pakistan 179 (Misbah-ul-Haq 79*, Umar Amin 25, Vernon Philander 3-26, Ryan McLaren 2-28) by four wickets. The Green Shirts were dismissed for 179 runs with 19 balls still available and the Proteas piled up 181 for the loss of six wickets in 38.4 overs. 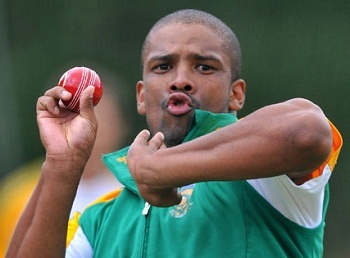 Vernon Philander (South Africa) was announced ‘player of the match’ for his fiery spell. Saeed Ajmal (Pakistan) was declared ‘Player of the series’ for his outstanding off spin bowling in three games. The third and final One Day International of the series was played on Saturday, November 30, 2013, at SuperSport Park, Centurion. Earlier, AB de Villiers, the skipper of the Proteas, won the toss and offered the batting to the Green Shirts who lost their two batsmen for seven runs. Sohaib Maqsood and Umar Amin tried to rescue their team but they departed one after another after scoring 25 each as the total reached 67. The tourists were struggling at 7-97 in 28.1 overs when Abdur Rehman associated with Misbah-ul-Haq who was stranded at his end. The duo kept on ticking the score board while the latter was dropped at 43 by Jean-Paul Duminy. Misbah-ul-Haq reached his 33rd ODI fifty and the 8th wicket partnership was dislodged at 148 when Abdur Rehman was gone for 22. 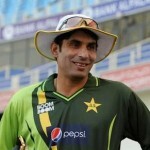 The Pakistani captain remained unbeaten for 79 while their entire side was bowled out for 179 in 46.5 overs. Vernon Philander was the main wicket taker with three, Lonwabo Tsotsobe, Ryan McLaren and Imran Tahir shared two each whereas Wayne Parnell held one wicket. The openers of South Africa provided a reasonable start by scoring 39 and the second wicket fell ten runs later. Jean-paul Duminy got together with Hashim Amla who was going smooth but was runs out for 41. The first became the fourth victim at 84 when AB de Villiers and David Miller got off for consolidation. They took the score to 124 when Miller departed for 24. Ryan McLaren and de Villiers kept on creeping towards the target by enhancing the score to 164. Saeed Ajmal clean bowled McLaren for 17 but his skipper kept on cruising towards the small target. AB de Villiers remained unbeaten for 48 as the host powered 6-181 with 11.2 overs to spare. Saeed Ajmal was the highest wicket taker with two whereas Sohail Tanvir, Bilawal bhatti and Abdur Rehman got one each. 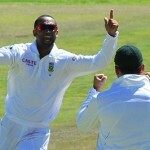 South Africa clinched the final encounter with a margin of four wickets but Pakistan grabbed the series 2-1.